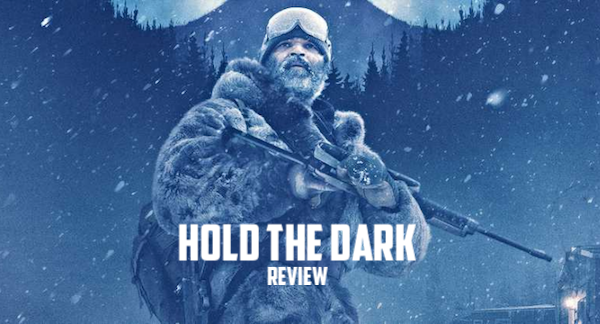 With Hold the Dark, Jeremy Saulnier brings his craftsmanship to the icy northern climes of Alaska to deliver an ambitious slow-burn thriller with western and horror sensibilities. The two-hour journey is not without its moments of intrigue, but winds up being a brutal trudge that confounds more than it satisfies. Retired naturalist and wolf expert Russell Core (JEFFREY WRIGHT) journeys to the edge of civilization in northern Alaska at the pleading of Medora Slone (RILEY KEOUGH), a young mother whose son was killed by a pack of wolves. When Medora's husband Vernon (ALEXANDER SKARSGARD) returns home from the Iraq War, the news of his child's death ignites a violent chain of events. As local cop, Donald Marium (JAMES BADGE DALE), races to stop Vernon's vengeful rampage, Core is forced on a perilous odyssey into the heart of darkness. Based upon the novel of the same name by William Giraldi, with a screenplay penned by frequent Saulnier collaborator, Macon Blair (who also appears in a cameo), Hold the Dark marks the first instance of Saulnier working from material he himself has not written. Yet, he manages to leave his deliberate fingerprints all over the film like animal tracks pressed into fresh powdered snow, and it’s slightly elevated by that. Despite all his efforts, Hold the Dark may be Saulnier at his worst, but that is in no way an out-and-out insult. Similar to what he’s done with Green Room and Blue Ruin, Saulnier brings his distinct in-your-face realism to the project, which leads to some truly mesmerizing and brutal sequences that won’t be easily forgotten — the mid-film shootout is without a doubt the most intensely visceral thing I’ve seen so far this year. That said, the film never reaches its full potential or comes together in a way that completely clicks. The film’s fatal flaw is its ambiguous nature, which keeps the viewer at arm’s length and never lets them get up close and personal. The plot is definitely muddled by this and is, at times, too murky for its own good. While the ambiguity lends a certain mysterious quality, it also has the tendency to alienate the viewer. It won’t leave you feeling wholly bored, and it’s definitely enough to make you think; it just doesn’t draw you in as much as you may like. The pace is as slow as water turning to ice, which isn’t doing the film any favors, but the rattlesnake bites of violence are done in that unmistakable Saulnier style that serve as a smack in the face and keep you from totally checking out. However, unlike Green Room and Blue Ruin, it’s too easy to drift out of Hold the Dark’s cold and unwelcoming narrative; the set up and the build make for a pretty intriguing ride, but all momentum comes to a halt by the anti-climatic last act. Bleak, brutal, and icy to the touch with a microscopic bead of warm light that shines through the darkness, Hold the Dark is less of a traditional narrative and more of an exploration of nature's brutality juxtaposed against human brutality, positing that they're one in the same. It’s definitely a film that promotes discussion and may offer new rewards with each new rewatch, but it’s a tough journey to endure, and it leaves far too many questions unanswered to totally satiate the baying wolf in us all. Rating: 2.5 wolves outta 5. What did you think? Where does Hold the Dark sit for you amongst Saulnier’s work? We want to know? Share your thoughts and feelings in the comments section below, and as always, remember to viddy well!